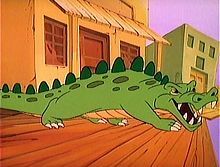 A Crocodile from The Super Mario Bros. Super Show! Crocodiles are real-life animals that have made appearances throughout the Mario franchise and its related series. The Kremlings are a race of advanced crocodiles, but typical crocodiles have made a few appearances throughout the Mario franchise as well. Their main appearance is in The Super Mario Bros. Super Show! episode "Crocodile Mario", where they are portrayed with voracious appetites, and inhabit Down Under Land. In "Crocodile Mario", Kangaroo Koopa steals the Magic Statue, which repels crocodiles, from a town in Down Under Land. Without the artifact, the crocodiles are free to roam the town. They come close to eating everyone there, almost eating the entire general store and the tree that everyone takes refuge atop of in the process. Mario and Luigi eventually retrieve the Magic Statue and liberate the town from the crocodiles, who choose to pursue Kangaroo Koopa instead. In Mario + Rabbids Kingdom Battle, a crocodile makes a cameo appearance in the Gallery mode. This page was last edited on May 10, 2018, at 20:10.